Choking plumes of hot ash, thick smoke and torrents of lava - such apocalyptic scenes could be witnessed in Indonesia as Mount Sinabung struck, killing at least seven people. Social media has been flooded with photos and videos of the devastating volcano rumbling to life. The 2,460-meter-high Sinabung, one of 127 active volcanoes in Indonesia, has been erupting since Saturday. All victims were found in the village of Gamber in close proximity to the volcano, National Disaster Mitigation Agency (BNPB) spokesman Sutopo Purwo Nugroho said in a statement. The people were working on their farms when they were killed. “Nine people were struck by the hot clouds,” Nugroho said. Six farmers died on the spot, and the seventh died in the hospital, while the other two are in critical condition, he added. The Gamber village, located about 4 kilometers away from the slope, is considered to be one of the red zones, which means its inhabitants are in danger if the volcano erupts. "It is not immediately clear how many people were in Gamber because when the mountain spewed clouds of hot ash, there was not supposed to be any activity in the area," Nugroho added. According to the BNPB, the volcano spewed volcanic ash up to 3 kilometers high into the sky and tumbled the ash as far as 4.5 kilometers westwards into the near-by river. Security personnel blocked some villagers from entering their villages who are located in close proximity to the volcano. 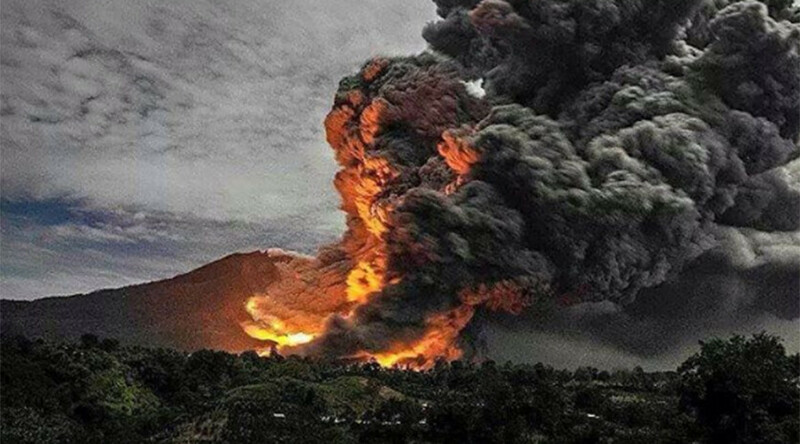 Mount Sinabung is prone to seismic upheaval as it rests on the so-called Ring of Fire encircling the Pacific Ocean. It had been quiet for around 400 years until it rumbled back to life in 2010, and then again in the fall of 2013. The 2014 eruption killed 16 people, including several children.